My sewing room has kind of been taken over lately. I still call it my “sewing room”, but it’s being slowly taken over by vintage apparel and accessories, haha! I spend a stupid amount of time reorganizing it. But, if we’re talking like Marie Kondo, pretty much everything in there brings me joy, so it’s worth it. I thought it would be fun to start sharing some of what I have. I love researching the labels and styles of the garments I find. You can learn a lot from the construction of the garments, and I think it’s fun to look more into the history of clothes. 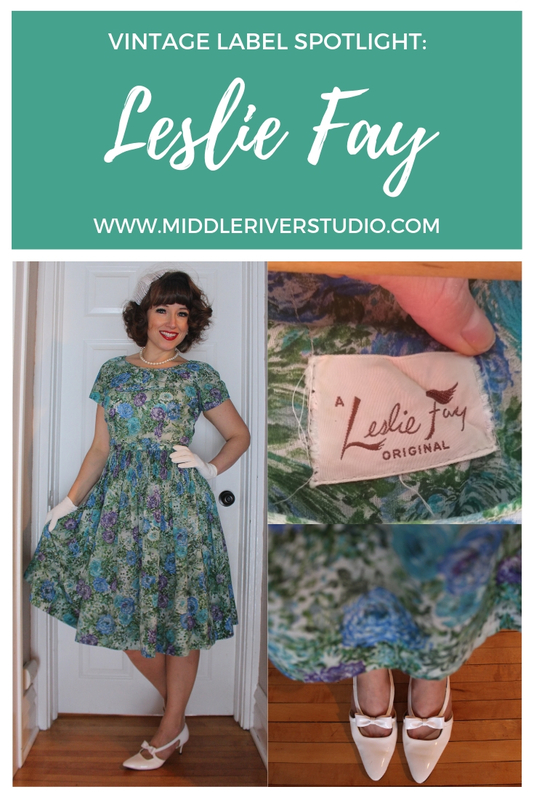 I figured I might as well pick one of my favorite dresses to start out, so here is this gorgeous floral Leslie Fay from the 1950s! The pleating at the top of the skirt is gorgeous, and the bodice is rather unique. It’s subtle and hard to see with the floral print, but there’s this pleating and bow on the bodice. Leslie Fay was founded by Fred Pomerantz. During World War II, he had produced uniforms for the Women’s Army Corp. In the 1940s, the Works Progress Administration gave a grant to conduct a study on women’s sizing. Over 15,000 women were measured to try to create a standard for women’s garment sizes. These measurements were given to producers like Pomerantz to ensure they would create uniforms that fit. After the war, Pomerantz decided to use these measurements and create his own line of women’s clothing. Thus, Leslie Fay, named after Pomerantz’s daughter, was founded in 1947. As a side note, all those measurements from the WPA? And the sizing standard they produced? It was kind of a mess. Because—surprise!— the female form is pretty darn complex, and there’s not much to be said for “standard” sizing. They identified at least five body shapes (instead of just the hour-glass shape that manufacturers were previously working off of) and created a three-part system, involving height, upper body, and girth. It was not at all practical for manufacturing clothes. Anyway, back to Leslie Fay! They went public in 1952 and Fred’s son, John, took over in 1972. It seems like those were all pretty good years for Leslie Fay. They were popular and well-represented in the department stores. Then the tumultuous 80s and 90s hit, and Leslie Fay had a lot of ups and downs. As other large manufactures started to use computers in the 80s, Leslie Fay didn’t keep up with technology. Similarly, they didn’t keep up with trends, and found that consumers were now thinking of them as “matronly” and out of style. I found this Leslie Fay at Goodwill, and understood that concept, ha! But, Leslie Fay responded with gusto, hired new designers, installed over 500 boutiques within department stores, and tripled their profits in 10 years. Which was then followed by more ups and downs with the economy, dress sales, and again with the “old-fashioned” image. Annnnd then, it was reveled that the CFO had been doctoring the books from 1990-1992, unbeknownst to Pomerantz. Leslie Fay entered bankruptcy as a result. However, they did manage to remain open, emerge from chapter 11, reorganize, and turn themselves around. In 1999, the company obtained the license to the Liz Claiborne Dresses and Elisabeth Dresses labels. There were a lot more business/stock related ups and downs, but that’s the gist of it, ha! So that’s that! 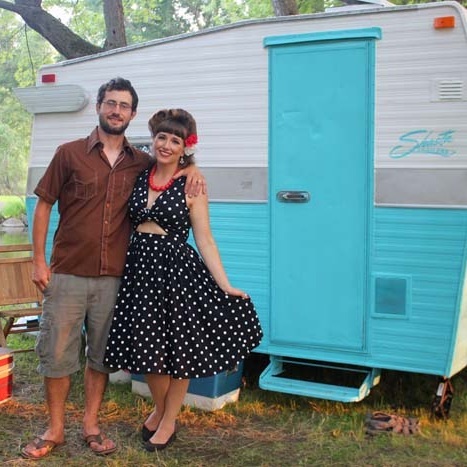 I hope you enjoyed learning a little more about the Leslie Fay! I’m going to keep on with a little mini-series here on different labels from my vintage closet, so watch for more in the future!